Remember a couple years back when I went a bit mental on hair dye and would diy color my hair a different shade almost every month? There was orange first before going into blonde, then blue, bright purple and finally plum. Anyway...I usually go to JURO for my hair needs and have been planning a visit since around September last year to go in for a cut and color (I plan that far back because it's quite expensive but you only need to go in at least 2x/year) in time for my holiday vacation. Before I could book an appointment, I got an email from Azta Salon asking if I would like to try their new Chromabond treatment (see review HERE), my curiosity got the better of me so I said yes only to find out that I wouldn't be able to dye my hair again until January. I've no regrets about my Chromabond treatment, in fact I love it so much and don't know if I can live without it anymore but the color, being similar to a cellophane treatment, washes out after awhile and I'm left with super aging white hair at my temples. I didn't want to have white hair in my vacation photos and there wasn't really enough time to book an appointment at a salon so I did the next logical choice which was to visit Watson's. I was initially planning to purchase my usual L'Oreal but then I caught a glimpse of all these other cutesy Asian dyes across the shelf. I have heard about these foam dyes and have always been quite curious so I decided to get one and finally try it out myself. I was choosing between 2 brands (forgot the name of the other one but it was significantly cheaper at around P280). I had not done any research beforehand so I was relying purely on gut. I decided to go with the Palty because it's Japanese made and so far I have loved every Japanese beauty product I've ever tried from K-Palette to Cure. Instructions on the outer box are purely in Japanese. Inside it contains a plastic cup, mixer, cream dye, water solution (developer), conditioner, gloves that actually fit and to my delight, an instruction manual with proper English translation (yay). I love how everything Japanese tend to look Sanrio-ish. 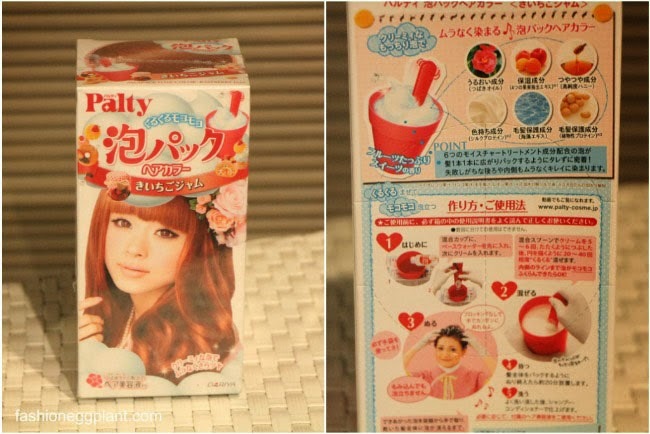 Just like traditional hair dyes, you first empty all contents of the "water" into the cup followed by the cream dye. You're then supposed to "chop" it up and down (similar to when you break butter in eggs when baking) followed by mixing it around. The instruction manual says to mix only until you reach the inner mark in the cup but I guess I got a bit carried away with the chopping that it only took a few swirls before my mixture started drpping over the brim. In the end, it didn't matter though, it's not really an exact science. Reminds me of a banana smoothie. Never mind the undisolved bits, they won't matter and will simply blend once you apply the dye to your hair. Now the tricky part, applying it evenly onto your hair. Contrary to what other reviews may have said, I actually find Palty less messy than other dyes. I hardly dripped any product onto my floor and sink. 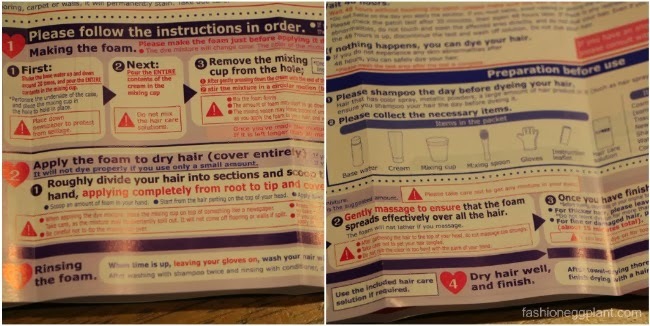 Back to dyeing, make sure to follow the instructions and not just dump the solution onto your head. 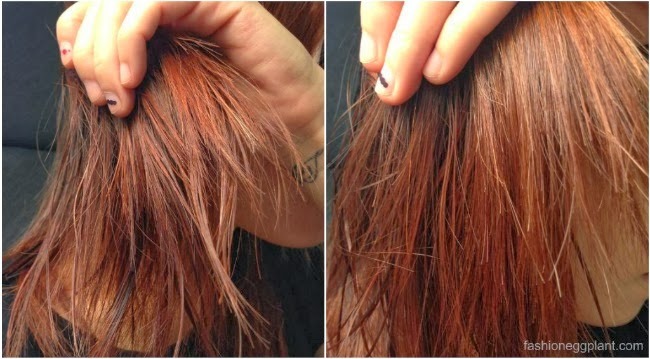 If you want a nice even color, make sure you apply only to your roots first because the roots take longer to achieve lift. Next you'll want to roughly section your hair and apply the dye one section at a time by scooping small amounts into your hands and rubbing it in lightly. Finish off by massaging your scalp to ensure the dye is distributed evenly. Leave on for 20 minutes, add 10 if you have thick hair like mine then rinse off with warm water and apply the conditioner provided. It provided about 90% gray hair coverage which was okay with me, I just simply plucked out the few resilient ones left. The red undertone is more visible and vibrant and it has been that way since then. I clean my hair with Cynos Argan Oil Shampoo and Conditioner (see HERE) which probably helps the color from fading out quickly. Overall, using Palty was a fun and positive experience. It seems to work extremely well on thick, coarse Asian hair like mine and I would definitely purchase it again in the future.